Entire MARINE SURF WAIKIKI is a 100% smoke-free property and all condos are non-smoking units! There are no exceptions to this rule. Please do not reserve a condo if you can't respect this. Some of our guests are allergic to smoke and we need to do everything in our control to respect their comfort level. Smoking on lanais (balcony) is also NOT allowed. A $250 cleaning fee will be added to your bill if smoke is detected in the condo upon your departure. Additionally, the Marine Surf Waikiki does not allow smoking in any of the public areas including the lobby, elevators, hallways, laundry rooms and the lanais located on each end of the hall corridors. When booking directly with TROPICAL STUDIOS INC., a reservation deposit will be required to reserve the dates of your stay. If you make your reservation less than 30 days prior to check-in date, the full amount is due at the time of booking and is fully non-refundable. If you made your reservation more than 30 days prior to check-in date we will collect reservation deposit:$200 for stays up to 14 nights and $400 for longer stays.Full amount will be collected from the same credit card 30 days prior to your check-in date. We will email you an updated confirmation invoice. If you wish to use a different form of payment to pay the full amount please contact us by phone or email.Credit card is preferred but other forms of payment will also be considered per request.We will also require a written statement that you have read and agree with all terms and policies specified in this document (email is fine). You can sign and date at the bottom of the last page and scan, fax or email it back to us.If your booking was made using one of the full-service vacation rental booking systems (airbnb, flipkey, homeaway, booking.com etc. ), their respective policies will apply. All cancellations must be in writing (email is fine). Deposit becomes not refundable 90 days prior to check-in date.Full payment becomes not refundable 30 days prior to check-in date.If your booking was made using one of the full-service vacation rental booking systems (airbnb, flipkey, homeaway, booking.com etc. ), their respective policies will apply.Refunds of any credit card transactions will incur 5% cost. No pets are allowed in the condos or in the common areas of the building. If you require a change to your reservation, please let us know as soon as possible. Changes to your reservation less than 30 days ahead may not be honored depending upon the time of year the change is made. Acceptance of a change is at TROPICAL STUDIOS discretion and will be stated in writing. A three-night minimum exists for all stays if you decrease the duration of your existing reservation. Additionally, a change in the length of your stay will alter the rate shown on your Invoice as posted on the Rate Schedule. We are a small company and cancellations and no-shows affect us greatly! We understand that certain circumstances occur which may require you to cancel your reservation at the last minute. Instead of not showing for your check-in and honoring your reservation, we ask that you PLEASE let us know AS SOON AS POSSIBLE in the event you do need to cancel, so we may be able to still rent the condo on a last-minute basis. This is the only way we can assure the quality and continue offering discounted rates for our future guests. Credit card information on file is required as a security deposit for all rentals, regardless of final payment method. Tenants are responsible for all damages and for missing items. Damage and breakage caused by a tenant should be reported immediately. Renters assume liability for any damage to condos or contents.If no Credit Card can be provided prior to check-in a cash security deposit of $500 will be required. This will be refunded upon the check-out.We reserve the right to authorize up to $500 on your credit card for the duration of you stay for Security Deposit guarantee. Guests are responsible for all damages to the condo and/or its contents and will be charged for repairs and/or replacement of all items damaged during your occupancy. We make every attempt to replace broken items with like or similar items, but in the event an item cannot be repaired or a part replaced, the guest is responsible for the cost to replace the entire item. A one-time, non-refundable $100 cleaning fee will be added for all stays for up to two guests per condo. Guests are expected to leave the condo neat and clean to avoid additional charges for major cleaning and damages. An additional cleaning fee will be charged to your account if the condo is not left neat and tidy after your departure. There is no daily housekeeping service. For your convenience, extra linens and cleaning supplies are provided. Guests are requested to leave the condos clean upon departure but washing of bed linens and towels prior to departure is not required.Daily Maid Service can be provided at $75/day and needs to be pre-arranged in advance. Card-operated laundry facilities are located on each floor. The laundry card is funded by using the machine located in the lobby by the mailboxes. The laundry card is provided ($0 balance) and must be left in the condo when you check-out. A charge of $10 will be debited from your account if you fail to leave the card or the card is lost. Check-in time is 3:00 pm and check-out time is 11:00 am – unless previous arrangements have been made. We make every attempt to accommodate guests promptly upon arrival, but due to scheduling and room cleaning, there may be a delay in gaining access to your room if arriving prior to 3:00 pm. We appreciate your understanding and thank you in advance. If the condo is not booked on the night before your check-in date we will be happy offer you a free early check-in. We will NOT commit to accommodate this request up until the day of your check-in.If the condo is not booked the night of your departure, we can offer you a late check-out (before 8 pm) for a one-time charge of $75.Please be advised that this offer is only good if the condo is NOT booked the night of your check-out. In the event the condo is booked by another guest, the late check-out will not be offered and check-out time will remain at 11:00 am.We will NOT commit to accommodate this request up until 1 day prior to your departure. The only way to have a guarantee of early check in (before 3:00 pm) or late check-out is to book an extra night. Please be advised that since this is a private condominium, there is no storage available for your luggage after you check out. If your travel arrangements require a late departure and you wish to retain your luggage in the condo, we suggest you book an additional night's stay. We can recommend services of www.hawaiibeachbum.com in that regard.If you arrive early we might be able to allow you to store your bags during the time our housekeeping team is servicing your unit. This shall be requested upon arrival and will be dependent on the housekeeping team schedule. These condos are located in a residential/hotel building. We kindly ask you to be respectful of your neighbors in condos surrounding the one you rent. Quiet hours in the building are from 10:00 pm to 7:00 am. Late night parties and loud discussions on the lanais after 10:00 pm will not be tolerated. 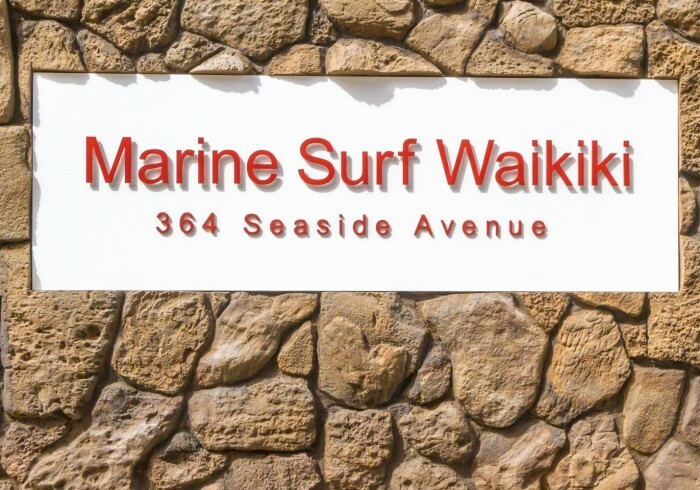 In the event you plan on renting a car, parking in the Marine Surf Waikiki is included with your rental at no additional cost. Please be advised that the maximum height for any vehicle entering the garage is 6'-2". When renting a car, particularly an SUV, verify the height with the rental agency prior to collecting the car. TROPICAL STUDIOS accepts no responsibility for damages to any vehicle when parked in the garage. Due to the high cost of the electronic security keys, any lost security key will be replaced at a cost of $50 each and will be charged to your account. It is your responsibility to leave all sets of keys in the condos when you check out. If sets of keys were separated during your stay they must be placed together on the rings as you found them before you check out. In the event the locks must be changed, you will be charged $200. Please keep a key with you at all times to prevent accidental lockouts. In the unfortunate event you're locked out of the condo without keys, a $50 lockout charge will be assessed for someone to come and let you in your property, regardless of circumstances. It is the responsibility of all occupants and guests of the condo to verify when leaving they have their keys, and the door to the condo is properly closed and locked. We cannot be held responsible for personal items left in rental units. However, we will make every prudent effort to return items to you, given prompt notification of loss. Please let us know what you forgot within 7 days of your departure if you wish your property returned. We'll ship to you, and ask you to pay the cost of shipping. Any items not claimed within 14 days will be donated to charity. We continuously upgrade our properties and reserve the right to make modifications to the interiors as necessary without notice. Updated photographs will appear on the website after alterations are made to the condos. We currently provide free, wired and Wi-Fi high-speed internet access in all of our condos. The router provides a wired means of connection and a cable is provided for your use. We also provide wireless internet access (Wi-Fi) and a network name and password will be provided upon check-in. Please be advised that we provide this access point as a courtesy to our customers, but are not able to provide technical support for your connection. If your laptop is secured with firewalls and anti-virus software you may have difficulty in connecting and we suggest you research this issue before you arrive. It is the responsibility of each tenant to dispose of his or her garbage. Trash chutes are located on each floor in the laundry room. Trash should be removed from the condo upon departure. We will not be responsible for accidents that occurred on or because of rental property. Agent will not be held responsible for acts of theft or vandalism or damage to guest's personal property. Refunds will not be given for late arrivals or early departures. If hurricanes or other extreme weather conditions occur and you choose to leave before the end of your reservation, no refund will be given. The maximum number of persons allowed in each property is stated in the property description and on your Rental Agreement & Confirmation. Children are counted unless under the age of one (1). This represents the total number of people allowed to occupy the property inside or outside, day or night. Hide-a-beds are included in capacity, but are not recommended for adult use. We are very serious about maintaining a family atmosphere for the quiet enjoyment of our guests. We do not rent to groups of teenagers with or without chaperones regardless of whether the chaperones are parents of one of the teenagers. We will rent to family groups, married couples, and RESPONSIBLE ADULTS over the age of 25. Any reservation made under false pretenses will be subject to forfeiture of advance payment of rent and deposit, and the party will not be permitted to check in. Violation of this policy will result in immediate eviction without refund of rent. We reserve the right to change policies, prices, descriptions and condo availability without prior notice. Check-out time is 11:00 am or earlier. Leave all sets of security keys provided at check-in on the kitchen counter. The elevator will take you down to the lobby without the FOB. If you have car in the parking structure – you can leave it without the FOB also. Please do not strip bed linens or launder sheets and towels. Our housekeeping does that. Close the sliding door to the lanai. Remove all trash from the kitchen and bathroom and dispose of in the trash chutes located in the laundry room on each floor. Empty the coffee maker and dispose of coffee grinds. Wash all the soiled dishes, glasses and silverware. Remove and dispose of all perishables from the refrigerator. Remove all personal belongings from closet and dresser drawers. Place all soiled towels in the bathtub. Do not launder comforters or pillow shams as these items are dry-cleaned. Turn off TV, stereo and all electronics. If furniture has been moved please relocate it to the position you found it in when you checked in. Air conditioning may be left on. Make sure to close the door completely. Come stay at our beautifully furnished, fully equipped and nicely decorated apartments! Studios are located in the very center of the world-famous Waikiki resort, close to the Waikiki Beach, all nightlife, and restaurants, grocery store, so you can enjoy your vacation with all the fun, beach activities, shopping and nightlife! Guests have access to all the apartment and building amenities, including an outdoor pool, laundry room, and restaurants on property. Waikiki is the mecca of thrill-seeking travelers, with a long stretch of world-famous beach, shopping, nightlife, and dining! Almost everything is within walking distance here. Royal Hawaiian Shopping Center is 400 meters from the apartment, while Kuhio Beach Torch Lighting & Hula Ceremony is 600 m away. Renting a bike or a scooter from a rental shop across the street might be a fun idea to explore immediate surroundings, but to check out all the island sites we recommend renting a car. Have we already mentioned that FREE Parking is included?